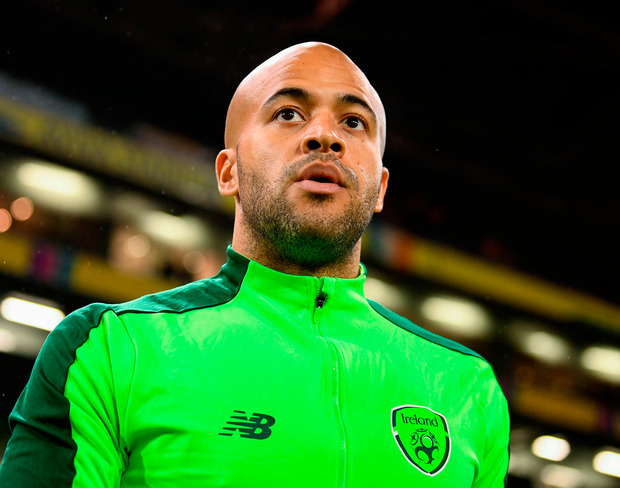 Darren Randolph wants Ireland to be brave on the ball and mix brains with brawn when they face Wales in Dublin. The Middlesbrough keeper suffered for the cause when he had a shoulder injury during Saturday's 0-0 draw with Denmark, but he has since recovered well and will be fit to start against the Welsh. And he's eager for Ireland to up their game compared to the last outing against Wales. "We have to play differently to how we did the last time. Use the ball better, be a bit braver," he says. "It's international football and this is a new squad coming together, it might take people time to get comfortable and get used to international football and now there are no friendlies to blood people, you are right into games that matter and mean something. "It's about being physical, that's one of our strengths but it's also about getting on the ball and proving that we can play, the boys at their club teams get on the ball and play football every week." He is keen for the side to make up for last month's 4-1 loss in Wales but Randolph insists that setting out on a revenge mission is risky. "You say revenge but we need to win, and we will feel even better if we do win, it might feel like revenge then but you can't go out there with that in your head and go hell for leather from the start, you will get into trouble if you do that," he says. "The last game of the group is Denmark away and we can go there with four points and win, it's all to play for. Anything can happen, we're looking to beat Wales and take that to Denmark."